This is a fun craft project (or science project) for an indoor afternoon. 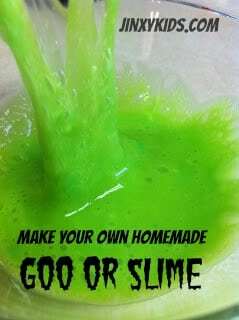 You can make your own homemade slime!! (The slime is actually a polymer, with Borax serving as a the crosslinking agent for the glue molecules to string together to form larger molecules – the polymer.) This is quite simple to do. I love the way ours turned out with that funky green color! In one of your mixing bowls, combine 1 1/2 teaspoons Borax with 1/2 cup of lukewarm water. Stir until Borax is dissolved. In the second bowl, combine 1/2 cup glue and 1/2 cup of lukewarm water. Stir until well mixed. Transfer the contents of both bowls into the baggie. Add in a few drops of food coloring. (We used equal drops of green and yellow to get that fluorescent type look.) Knead the baggie with your hands until the slime starts to bind together. Transfer to a bowl for playing and have fun! 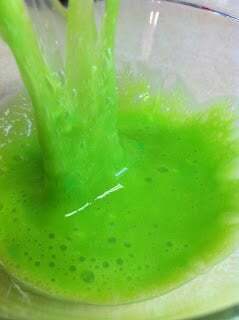 OOO really looks like slime, lol. My boy would have a field day with this :0) I’ll hold fire for now until he learns how to learns how to help clean up. This looks just like the slime from Nickelodeon! I wanted to make this when I was a kid.